Do you love animals? Have you ever thought of finding a career that lets you work with them? Imagine spending your days tending to the needs of our furry friends. If you want a career with animals, you have many options from which to choose. Take time to explore each one. They are very different from one another in terms of responsibilities, education and training, and earnings. While one may not be a good choice for you, another could very well be. Veterinarians are health professionals who provide medical care to animals. Some specialize in treating pets, livestock, zoo, sporting or laboratory animals. They work in animal hospitals and clinics alongside veterinary technicians and assistants. They are the most highly compensated members of those facilities, but also have the greatest responsibilities and educational requirements. 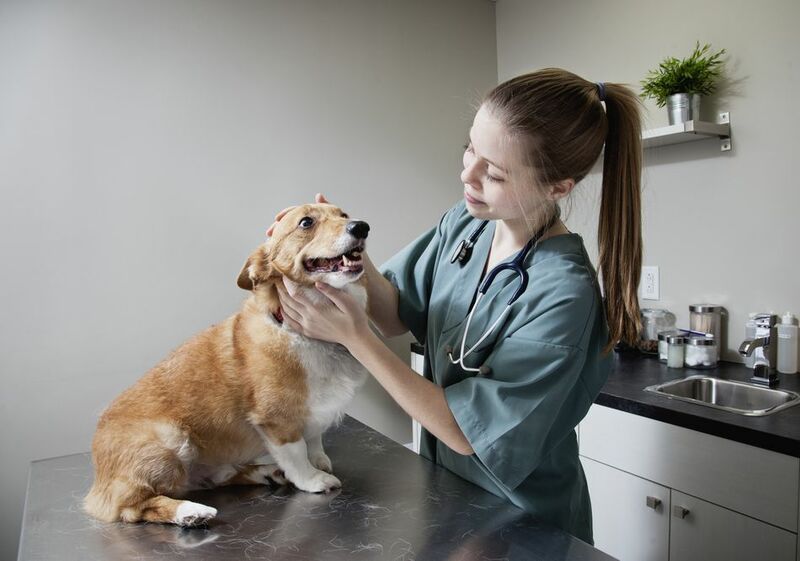 If you want to work in this health profession, you must first earn a Doctor of Veterinary Medicine (DVM) Degree from an accredited veterinary school. Most applicants to veterinary schools have a bachelor's degree, but that isn't a requirement. It will, however, make you a much more competitive candidate. After graduating from veterinary school, you will have to get a license from the state in which you want to practice. You must take and pass the North American Veterinary Licensing Exam (NAVLE). Veterinarians earned a median annual salary of $88,490 in 2015. This was over two and a half times what the next highly compensated employee in his or her practice, a veterinary technician, earns. However, not everyone is willing to spend approximately four years in school. That doesn't even include the time you will spend in college before entering a veterinary medicine program. Veterinary technicians help veterinarians diagnose and treat animals. They are sometimes referred to as veterinary technologists although there are subtle differences between the two occupations. Veterinary techs, as they are commonly called, conduct clinical and laboratory procedures. They assist vets in performing examinations, take x-rays and prepare animals for surgery. To become a veterinary technician, you must earn an associate degree from a two-year veterinary technology program. Licensing requirements vary by state but most likely you will have to take the Veterinary Technician National Examination (VTNE). They earned median annual wages of $31,800 in 2015. Veterinary assistants perform basic tasks such as feeding, bathing and exercising animals in their care. They clean and prepare examination and operating rooms in animal healthcare facilities. Sometimes they collect blood and urine samples. Veterinarians and techs supervise them. You won't have to have formal training to get a job as a veterinary assistant although some employers prefer to hire people who have experience working with animals. Most will provide on-the-job training. Veterinary assistants earned median annual wages of $24,360 in 2015. Animal trainers teach dogs, horses, and marine animals to behave in a certain way. They prepare them for riding, security, performance, obedience or assisting people with disabilities. To work in this occupation one usually needs at least a high school diploma or its equivalent, although a bachelor's degree is required for some jobs. You can get certification, but it isn't required. Animal trainers earned a median annual salary of $26,610 in 2015. Groomers help make sure pets look their best. They shampoo and trim their fur, cut their nails and brush them. They work for grooming businesses, animal shelters, clinics, and pet stores. You can become a groomer by getting training through an apprenticeship. Alternatively, you may attend a two to 18-week program at a state-licensed grooming school. Certification is available but not required. Groomers and other nonfarm animal caretakers earned median annual wages of $21,010 in 2015. What Does a Groomer Do?